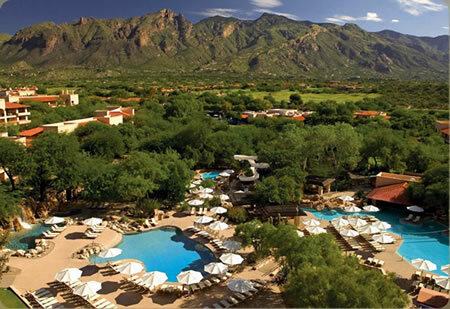 Nestled on 790 acres of stunning property in the foothills of the Santa Catalina Mountains, The Westin La Paloma Resort & Spa boasts spectacular views of the surrounding Sonora Desert and a delightfully sunny and temperate climate year-round. 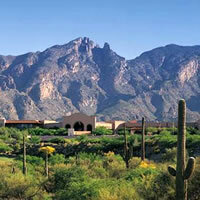 The atmosphere of The Westin La Paloma Resort & Spa offers unmistakably refined country club elegance. Surrounding the 487-room resort are the lush fairways of La Paloma’s 27-hole Jack Nicklaus Signature golf course, featuring the Ridge, Hill and Canyon nine hole courses, plus a complex of five refreshing pools with 177-foot waterslide, and a 9,300-square-foot, world-class spa. The AAA Four Diamond Award Resort's airy, southwestern architecture and warm golden hues echo the desert landscape. Rooms and suites invite relaxation, with cherry-wood furnishings and beautiful tile and granite details, plus private outdoor spaces with breathtaking views. Take Tucson Blvd. To Valencia . Turn right on Valencia . Turn left on Alvernon Way which turns into Golf Links. Deposit: Mandatory credit card deposit on all reservations. Cancel 7 Day Before Arrival. Cancellation penalty is 1 nights not including tax. The cancellation policy will vary based on the rate plan and/or booking date(s). Please see "Rate and Policy Information" when checking availability.